« When Arsenal spent their transfer budget on unwanted champagne – according to the manager. 3 February 1894: Last game for Charlie Booth. 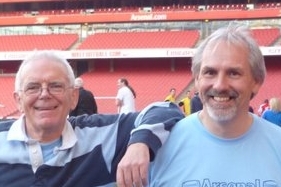 He played in the first ever league match for Woolwich Arsenal, and was a member of the team that played City Ramblers in the FA Cup in which he was one of the three who each scored three. It was also the first league game for Arthur Worrell. 3 February 1899 Bob John born. He was Knighton’s most successful signing, and played for Arsenal 470 times – more than any other player up to the outbreak of the second world war. 3 February 1901: After 4 November 1900 the London League had stopped for a winter break, and resumed on this day when Woolwich Arsenal played Queen’s Park Rangers away drawing 2-2 with a crowd of 600. 3 February 1902: QPR 2 Woolwich Arsenal 2 in Arsenal’s second season in the London league. The crowd of 600 showed that they were not impressed by the league – but matters were not helped with the game kicking off at 2.15pm on a monday. 3 February 1906: Arsenal beat Watford in 2nd round of FA Cup en route to the club’s first ever semi-final. 3 February 1909: Albert Beney signed for Arsenal from Hastings & St Leonards. He went on to play 16 times for Arsenal in the league and scored six goals before moving on to Carlisle United in 1910. 3 February 1917. In the wartime Football Combination Arsenal drew away with local rivals Clapton Orient. The temperature dropped to -5ºC and as a result the crowd was recorded as just 800. 3 February 1918: David Nelson born. He won the reserve league three times, but had only modest first team experience before being part of the transfer to Fulham which brought Ronnie Rooke to Arsenal. 3 February 1919: Having honourably admitted that there were no precedents for the issue of extending the league Tottenham staked their claim to be re-instated in the First Division after relegation. Athletic News responded suggesting that in the expanded 1st Division the places should go to Chelsea (because they were the victims of match fixing), Preston and Derby (as they were the top two in the 2nd division) and Arsenal (because of their crowds and support for the Football League against the Southern League). 3 February 1926: Sammy Haden broke his leg in the home match with Burnley which Arsenal lost 1-2. The match was in a sequence of just one win and one draw in six. His last game was a friendly against Corinthians on 21 September 1927 which Arsenal (or more likely Arsenal reserves) lost 0-4. 3 February 1937 Derby 5 Arsenal 4. This was a repeat of the score on December 28 1935 in the match against Sunderland and it heralded the second season in succession without a trophy. 3 February 1934: A surviving Arsenal/Everton programme confirms that the match represented a rare appearance of Alex James as captain. It ended Arsenal 1 Everton 2. After three losses and a defeat following Chapman’s death, it looked like the chase for the championship was over. It was also the last game for Ernest Coleman. He had been a brilliant player in the previous season with 24 goals in 27 games but this season scored just the once. 3 February 1937: Suffering from a range of injuries, Ted Drake scored his last league goal of the season, in a 5-4 away defeat to Derby although he did come good with goals in the cup. 3 February 1942 John Sneddon born. He played 83 games for Arsenal under Swindin and Wright. 3rd February 1956 Tommy Lawton, who as a Burnley player had rejected a move to Arsenal 20 years earlier, left Highbury and joined Southern League side Kettering Town as player-manager. 3 February 1958 Arsenal publicly withdrew from the transfer chase for Swansea Town’s Wales international winger Cliff Jones, stating that the Welsh club’s methods over the deal were unethical. 3 February 1973: Peter Marinello’s last appearance for Arsenal as a sub against Bradford City in the FA Cup. Arsenal ultimately lost in the semi-final and Marinello moved on to Portsmouth, before returning to Scotland. 3 February 1979: Arsenal continued their upward surge beating Man U (who were at the time in 11th place) 2-0 at Old Trafford in front of 45,460. The result meant that Arsenal had suffered one defeat in the last fourteen league games. Man U fans showed what they thought of it all by holding a mass walkout after Sunderland scored his brace on 62 and 63 minutes. 3 February 1993: Leeds 2 Arsenal 3 after extra time in the FA Cup 4th round replay. Cup. Wright got 2 and Smith the other. Match 9 of the Cup Double season. 3 February 1996: Arsenal 1 Coventry 1 meant four wins in 15 in the Rioch year. In the 11 games ending with this match Arsenal had scored 12 goals. 3 February 2001 Dennis Bergkamp scored the only goal at Coventry City to give Arsenal’s first away win since November. It was a moment the footballing world changed. Arsenal lost seven times that season but within a year Arsène Wenger was talking about an Unbeaten Season. 3 February 2004: Middlesbrough 2 Arsenal 1 (league cup) – despite the brilliant league run Arsenal went out. Keown was sent off on 45 minutes, Reyes scored an own goal after Edu had pulled it back to 1-1. 3 February 2009: Arsenal finally announce signing of Arshavin for £15m from Zenit St Petersburg, paying the club’s highest ever fee to date (it was only beaten by the fee paid for Ozil in 2013). It is said Arshavin had hired a private jet to take him to London on 1 February for the medical and signing. Kept your place in the top division because of your ‘support for the league’. Interesting choice of words. Why don’t you elaborate. Well there is a complete article on the subject on the site, but basically Arsenal chose the Football LEague in 1893 while Tottenham chose the Southern League. But when Tottenham resigned from the Southern League to apply for a place in the Football League and then did not get into the FL, Tottenham were left without a league to play in. However a subsequent withdrawal of a club led to another election for a replacement club and Arsenal supported Tottenham’s candidature and Tottenham got in. As I say, full details on the site.